QALITY ONE POOL MANAGEMENT is your go to company for pool care specializing in pool repair services. From minor equipment repairs to major ones, our staff has the expertise to handle them all. We use modern technology in our repair services that enables us to do our job quickly. Our company uses only top quality, warrantied parts. Filtering the water in your pool is essential for the safety of those who swim in it. Clean pool water allows your pool to function properly. The three main types of pool filters are sand filters, cartridge filters and diatomaceous earth filters. Sand tend are a low maintenance choice and diatomaceous earth filters get the water cleanest but any of the three varieties will do the job. We will give you all the details you need to make an educated decision. The humble pool cover has come a long way with many options available to keep your pool debris free in the off-season. You can opt for an easy to operate automatic cover that you can open and close any time you need to for safety purposes. Alternatively, you may want to add an eco-friendly solar cover to heat your pool using nothing but the sun. Pool covers come in many colors and materials to suit your preferences. On the surface, pool construction may seem like, dig a hole, inlay with concrete, plaster and fill with water; there is significantly more to it than that. For those just investigating what it takes to construct a swimming pool in Las Vegas (NV.) or spa there are some basic parameters which should be considered before, during and after pool construction. As with any construction project, a pool or spa must be properly designed. A design must consider and evaluate all conditions necessary to meet regulatory or building code requirements, sound engineering practices and needs of the Client. A good design is generally developed using a series of tradeoffs or comparing one condition or advantage against another, selecting it, then integrating it into the complete picture. 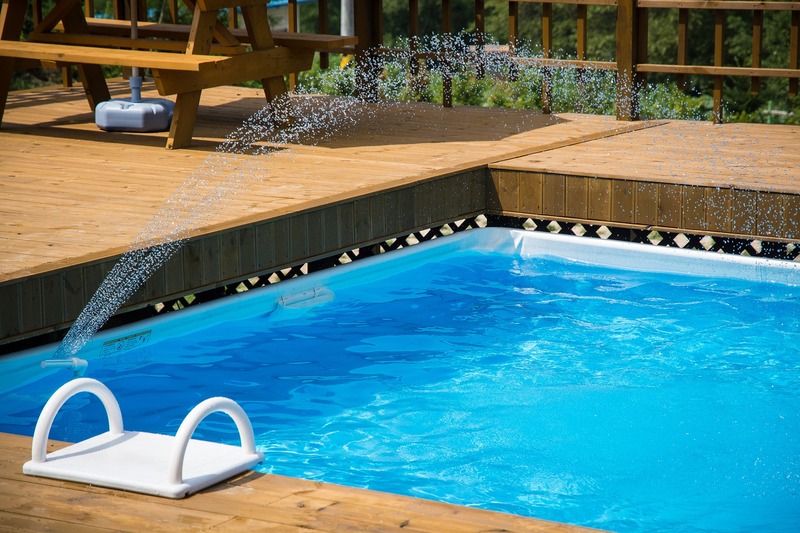 An example of this would be: how big (length, width, depth or gallons) should the pool be as compared to how much of a water bill can be afforded in the middle of the summer when the pool must be repeatedly filled because of evaporation. How big of a space is there to install a pool? Are there any distinct pool features such as an infinity edge desired? How often do I expect to use the pool? How many people might be in the pool at any one time? Should the pool be heated? Should the pool be cooled? What kind of pool automation is there? Who will be cleaning the pool and how often? Will the pool be used at night? What are the advantages or disadvantages of different types of equipment? Based on the answers to the questions above and many more, the designer goes to work. From the information provided, a concept design will be developed which incorporates all the attributes that are required by building codes, experiences of the designer as well as preferences of the Client. A designer must consider a full range of conditions in the development of the design such as existing soil conditions to root growth of any future landscaping. All of this must be considered before a shovel ever goes into the ground. Once all these questions are answered, then a detailed design can be developed for permitting purposes and the construction contractor. Pool construction begins with receipt of a permit issued by Clark County in conjunction with the Southern Nevada Health District. As part of the permit process, the local building inspector will identify what specific onsite inspections will be mandatory for their observance. Work may not proceed beyond any point identified by the Building Inspector until it has been formally accepted. In general, pool/spa construction is a concurrent activity with other construction elements of new facility or residential construction. The area associated for the pool/spa must be surveyed to identify its specific location and excavation requirements. Excavation can proceed based on the planned construction schedule/sequence. The construction schedule must account for the pool/spa and, all other activities not related to the pool/spa, but which are still in the area. Once the basin hole is dug it becomes a permanent part of the future landscape. Following basin structure excavation, there is a bevy of construction activities including reinforcing steel installation, plumbing and piping installation to support the filtration/circulation systems and water features as well as electrical to support lighting and control systems. All systems penetrating or embedding in the immediate basin structure must be installed before placement of the concrete/shotcrete. During this period there will likely be mandatory inspections performed by the local building inspector as part of the permitting process. Concrete is generally a strength of 4000 psi and is placed monolithically or via a shotcrete application. Completion of the pool basin structure is a major milestone for overall pool construction. Once the basin structure has been completed, follow on underground mechanical/electrical systems can be installed. These include piping, plumbing, electrical and control or automation systems which will connect the basin structure to the respective pool equipment. In some cases, this can be a short distance while in others, equipment rooms are located a significant distance away to avoid excessive noise or unsightly views etc. In general, the closer equipment is to the pool, the more economical the equipment purchase, and subsequent operational costs are. It is recommended that piping and electrical systems must be properly tested before and after backfilling operations. Most of these systems are located underground and once buried, are usually covered over with concrete pool deck or other landscaping ultimately leaving them essentially inaccessible. Hence, the need to test to assure their respective integrity. Part of this testing will likely including the witnessing by the Building Inspector. Once systems are completely tested and accepted to and from the basin structure, installation of the equipment may proceed. Equipment is identified by the design and usually procured by the constructor or developer. Equipment is generally set on an equipment pad and then connected to the previously tested integrating systems noted above. White plaster – marcite is a combination of cement, sand, and calcium carbonate (plaster dust). When applied it is troweled until the “cream” is brought to the surface. The cream hardens and becomes a protective layer (calcium carbonate). It is approximately the thickness of two to three sheets of paper. Quartz Plaster – pool finishes are a combination of a quartz aggregate and polymer-modified cement – technically making it a kind of plaster surface. Quartz surfaces are in ways the best of plaster and pebble finishes. Quartz holds up well against high amounts of pool chemicals and strong weather effects due to its non-porous nature. Pebble Tec – finish is purely cement and stone without calcium carbonate. There is no cream to be brought to the surface and the entire (1/2″) coating is the same all the way through. The pure cement is much more resistant to acid and of course the stones are impervious to acid. Once plastered the pool must be immediately filled with water, especially in Las Vegas (NV. ); because of the Summer heat. The purpose is to support plaster curing. After filling with water, the pool must go thru a plaster start up (cure) process which entails controlling the pH level and NOT introducing chlorine immediately. The proper startup operation requires significant attention for the first 10 days followed by additional monitoring and chemical adjustment up to 30 days. Skimmers: an important part of any pool. They remove surface debris. They are built-in and distributed evenly around the perimeter depending on the basin structure and volume. Skimmers must be sized as an integrated part of the filtration process. They must intake a minimum amount of water to be effective. The amount of water intake must be coordinated with the filter size. In lieu of skimmers an infinity edge may be used to perform the same function. However, an infinity edge has a completely different visual appearance and construction cost. Any type of infinity edge selected should be completely evaluated and considered by the Client before proceeding with construction. Main Drain: is not a mandatory structure but has become a standard design feature that promotes the circulating process in the pool/spa. It is a filter suction located in the bottom of the pool. It can be used singularly or in conjunction with the skimmer to draw pool suction for filtration. Water Returns: are the specific points at which filtered water is returned to the pool. They are generally located around the perimeter to promote pool/spa circulation. Circulating Pump and Filter: the heart of the pool filtration system. The pump and filter must be sized together. It is important to have a filter marginally bigger than the pump capacity. It is critical NOT to have a pump of greater capacity than the filter is designed to filter. An undersized pool filter will render it ineffective and, lessen its life; the larger the filter, the longer the time between cleanings. There are three common pool filter types – Sand, Cartridge and Diatomaceous Earth (D.E.). All three of these pool filter types will keep your pool and spa clean, but you should consider the needs of your specific application, your other equipment and plumbing size before making a selection. The correct filter size depends on the size of the pool. To maintain good water clarity, you must run the pump long enough each day to filter and sanitize the water in your pool. All filters have a GPM design rating and a turnover rate. A turnover rate of 8 or 10 hours is a typical sizing rate for residential pools. Commercial pools must turn over every 6 hours. All filters have flow requirements. D.E. filters are normally rated at 2 GPM per square feet (sq. ft.) of filter area for maximum flow. A 48 sq. ft. D.E. filter will have a maximum flow rate of 96 GPM, and a 60 sq. ft. model will be rated at 120 GPM. So if you have a pump that is going to flow 100 GPM, you would need to go to the 60 sq. ft. D.E. filter. For a sand filter, it is best to look at the flow requirements of each filter as it can vary from 15 GPM per sq. ft. and higher. Just make sure the filter you choose can handle the flow rates required. Cartridge filters are popular in residential applications. These filters don’t need to be backwashed and can save thousands of gallons of water each season. You should always adhere to the manufacture’s maximum flow rates and be sure not to size a cartridge filter too small as that may cause short cleaning cycles. Autofill: is a device that allows for the automatic filling of the pool/spa to maintain its water level. Automation systems typically include chemical controllers, timers, switches, remote controls and internet interface. In today’s world it is possible to check pool/spa chemistry remotely. For those with a residential pool/spa, it is even possible to turn the spa on and have it ready upon your arrival to home. All automation systems however, require integration and programming. While these systems generally function as advertised, over time programming can decay and these systems malfunction. In consideration of this, it is important to have all the desired features without having every feature to complicate the programming process. Towards this end the more sophisticated the programming, the more user training is required. While this may appeal to some there is nothing more annoying than wishing to utilize a pool/spa and having it malfunction. There are multiple types and brands of pool sanitizers available on the market, Chlorine comes in liquid, granular, tablet and stick form, and is an inexpensive and effective way to sanitize a pool/spa. Chlorine Tablets, specifically trichloroisocyanuric or Trichlor is the most commonly used. Unfortunately, trichloroisocyanuric tablets (Trichlor) is now becoming the subject of additional scrutiny regarding usage and health effects resulting from excessive cyanuric acid which is a tablet binder/conditioner used in stabilizing chlorine against UV rays. Salt Systems – Through the electrolysis process salt is converted to free chlorine for use in the pool/spa. Salt systems do not work below 40 F. During these periods liquid chlorine may be used. Calcium Hypochlorite – comes in tablet form and is free from cyanuric acid. However, it is costlier than Trichlor. Bromine – is another sanitizing chemical that can be used to keep water sparkling clean without any harsh odors and side effects like red eyes and skin irritation. It does not last in sunlight. Bromine is sold in 1″ tabs, and has many advantages over chlorine, but – you’ll also pay about twice as much as for chlorine tabs. There are numerous pool/spa heater manufacturers. Before selection of a heater, consideration should be given to the following: how often will I use a heater? A pool heater raises 60° F water 8°-10° F per day. The normal swimming temperature for pools is 84° F ° and 104° F for Spas. A larger capacity heater will heat faster. An electric heater will cost more than a gas heater. Pool/spa lighting is available in a multitude of types and colors. Existing lights may be incandescent while current technology is moving to LED’s. In utilizing LED’s there are differing colors and patterns of light that may be newly installed or retrofitted. Lights may also be placed on timers. Each of the above items has basic risks associated with their respective use. Pool Appurtantces are made available to support patrons with the transition into or out of the pool/spa. This transition is the most precarious time for all pool patrons because of the potential for slips, trips, falls or equipment overload. The safety of pool patrons is of the utmost importance. Care should be taken to ensure the selection of proper devices including their loading capacity and assurance of their proper anchorage.